Named for the Mayan god of rain, the Chaac Ha water collector is an intuitive and impressive invention for water preservation, which is becoming an increasingly immediate global obstacle. It was created by students from the Yucatan region of Southeast Mexico. This funky looking gizmo catches dew as well as rain and is also portable. 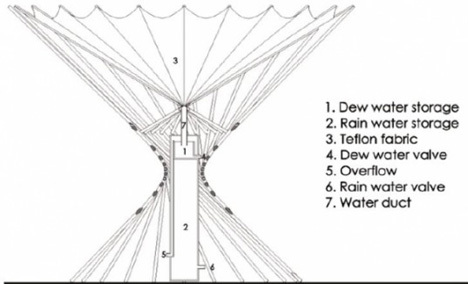 It collects 2.5 liters of water every night from dew alone. The design was developed by observing the water’s natural cycle. 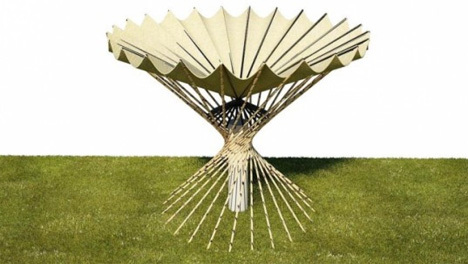 The layout of the Teflon fabric is meant to mimic the petals of a flower, which have evolved to collect moisture from the air. The students involved in the project used cutting edge 3D design software made by Autodesk, who awarded the recognized students with Autodesk Sustainability Workshop award. Their goal was to transport clean water to neighboring villages that don’t have regular access to the necessity. They achieved this as well as designing one cool looking yard decoration.